Abstract. In this article, we revise the estimation of the dose–response function described in Hirano and Imbens (2004, Applied Bayesian Modeling and Causal Inference from Incomplete-Data Perspectives, 73–84) by proposing a flexible way to estimate the generalized propensity score when the treatment variable is not necessarily normally distributed. We also provide a set of programs that accomplish this task. 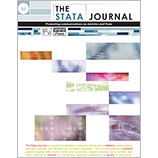 To do this, in the existing doseresponse program (Bia and Mattei, 2008, Stata Journal 8: 354–373), we substitute the maximum likelihood estimator in the first step of the computation with the more flexible generalized linear model.